Coleman Roadtrip Grill LXE vs LXX Review - Comparison in April 2019! Portable grills are a major issue for any road trip. You want to be sure you have an easy to set up, easy to carry, and easy to clean grill that will provide enough surface cooking area as well as a uniformed and controllable burn to get the most and best results. There are two grills from the same company, Coleman, that are causing some confusion when deciding which one to buy. Both are exceptional grills and are considered to be the easiest ones to use, which makes them perfect for beginners as well as experienced traveling grillers. 1. Coleman RoadTrip LXX Grill The Coleman LXX is the larger of the two and more expensive. To start off with, both grills share similar features and obviously similar operation functions. They both come with a pressure control system which provides a steady stream of heat. This gives cooking an even and thorough heat. Both grills tick the box for easy to clean, which is partially due to them both coming with a removable grease tray, and mainly due to their porcelain coated cast iron cooking surfaces. Another similarity is both works with16.4 0z propane canisters that don’t require a match to ignite the flame. With these similarities come similar issues, the main one is that both grills are powerful, where the LXE delivers 20,000 BTU and the LXX 22,000 BTU, this can overheat the food leading to faster yet burnt cooks. Essentially, the complaint is actually feedback that some cooks need to learn how to cook with higher heat and adapt to assure a better result. (Don’t blame the equipment). The actual con for both was the complaint that both units seem unsteady on their wheelbase, especially when being rolled from place to place when fully opened and in use. The bottom line for this is, don’t set it up in a place that might require you to move it after opening. 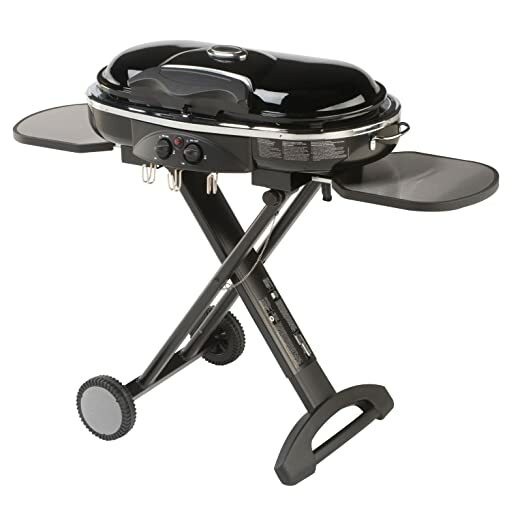 Don’t forget; these are budget friendly grilling units, not professional restaurant units for moving between tables. On the pro side, the power of these units, in comparison to their size was a surprise to most owners and was received favorably. Assembly of these units was fast, and that’s another pro in favor of both models. The final shared pro is their price, which was considered to be extremely budget comfortable. Customer service was also reported as being highly professional and efficient. The Coleman LXX is the larger of the two and more expensive. It comes with some impressive features that include transportation versatility. The LXX can be disassembled into parts that can be carried even in a backpack, making this an extremely versatile model for many applications. It is relatively lightweight, a total of 47 lbs, so when broken down into parts, can be distributed across a few backpacks. The wheels and stand are collapsible, and it has a very good pressure control system that gives cooks control over the steadiness of heat. As I mentioned above, some features are found in both, so I will concentrate on what is different. The LXX is bigger, provides 22,000 BTU, delivered through two burners of 11,000 BTU each, and it comes with sliding stainless-steel side tables. This model comes with a thermometer allowing the cook a better control over the quality of the meat. This similar or even identical features include a pressure control system that provides steady heat, a porcelain-coated cast-iron grilling surface, which makes cleaning easy. A 16.4 oz propane canister that is ignited without a match, and a removable grease tray. Both units come with additional accessorizing, that includes a swap top stainless steel porcelain coated griddle, an aluminum griddle, and a swap top stove grate. You can also buy a 5’ propane hose with adapter and a wheeled carry case. 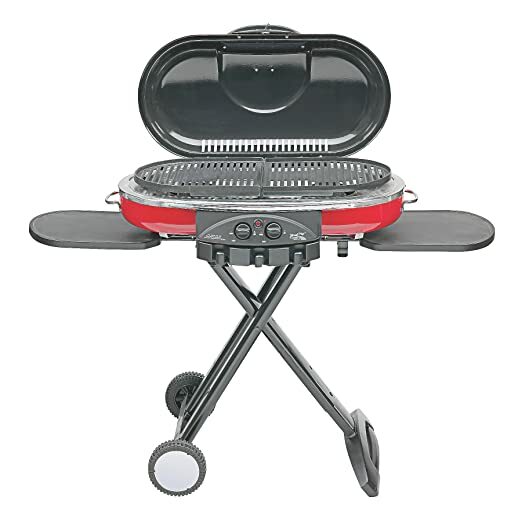 The Coleman LXE is the smaller of the two portable grills. Of the two it is sometimes preferred due to its price and weight ratio, where this one weighs 44lbs (it is only 3lbs lighter than the LXX model). As with the LXX the LXE can also be disassembled into components and distributed between backpacks. The LXE is also a powerful contender for being the better unit when comparing the price with its features. The LXE has two 10,000 BTU heaters providing a total of 20,000 BTU’s (Only 2,000 BTU less than the LXX) This unit comes with the porcelain coated cast iron griddles and grease tray that make these units so easy to clean and maintain. The 16.4 oz propane canisters provide the same amount of gas for power, although the LXE, as a smaller unit, will be able to work for longer periods of time. It also comes with a matchless lighting system. What is different is the size and the few items that are missing, such as the thermometer. As with the LXX, this unit comes with additional accessories including the stainless-steel porcelain coated swap top griddle, an aluminum griddle, and a swap top stove grate. You can also get the 5’ propane hose with adapter and a wheeled carry case as well as a grill cover.